Postcard US-2643270 from West Virginia shows a map of the West Virginia in the Appalachian region, noted for its mountains and wildlife, as well as various activities such as coal mining, recreational caving, skiing, whitewater rafting, fishing, hiking, and hunting. It is the 41st largest state by area and the 38th by population of the 50 States in the U.S. The state capital is Charleston, also the largest city in the state. In history, West Virginia was part of Virginia until those fifty northwestern counties of Virginia decided to secede from Virginia. It was admitted to the Union on June 20, 1863. 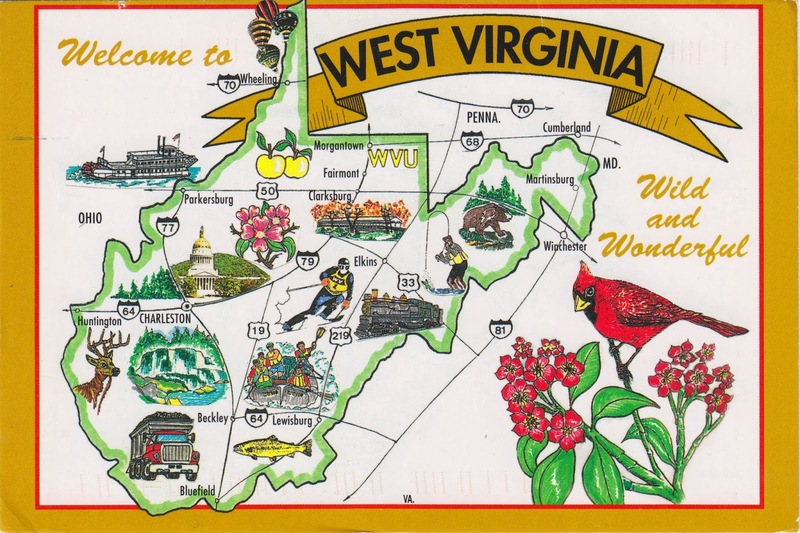 West Virginia was one of the only two states formed during the American Civil War. Nevada was the other state that separated from Utah. Maps are also great tools to help protect environment and human health. During a chemical spill in West Virginia on January 9, 2014 that had left thousands in Charleston and surrounding counties without drinking water, The Waterkeeper Alliance quickly developed an online map to illustrate the impact of 4-Methylcyclohexane Methanol spill on the Elk River just upriver from a West Virginia American Water facility. As West Virginia is bordered by Virginia to the southeast, Kentucky to the southwest, Ohio to the northwest, Pennsylvania to the north, and Maryland to the northeast, any emergency event has the potential to impact other states. In this case, Cincinnati in Ohio had stopped using water from Ohio River as chemicals from West Virginia Spill was moving downstream. There was another separate chemical spill in West Virginia on February 11, 2014. It shows the continuing challenges that West Virginia faces to preserve its traditional mining and logging industries while striving to protect its citizens and environment. New technologies including mapping might just provide the much needed help.